OBJECTIVE: To describe the operational effectiveness of the prevention of mother-to-child transmission (PMTCT) of HIV programme at McCord Hospital during the period 1 March 2004 - 31 August 2005. SETTING: McCord Hospital, Durban, South Africa. SUBJECTS: Antenatal patients attending the PMTCT clinic. MEASUREMENTS AND RESULTS: During the 18 months all 2 624 women (100%) attending the antenatal clinic received HIV counselling, resulting in 91% (2 388) being tested for HIV. The prevalence of HIV in the total cohort was 13% (95% confidence interval (CI) 11.6 - 14.2). Of the HIV-positive mothers 302 (89%) completed their pregnancy at the hospital, and in this group there were 3 intrauterine deaths, 1 miscarriage, 1 maternal death (with the baby in utero) and 297 live births with 1 early neonatal death. Only 11% (36 out of 338) were lost to follow-up. A quarter (668) of the partners of all women attending the antenatal clinic were tested for HIV. Delivery in 70% (209) of live births was by caesarean section. Nevirapine was administered to 98% (290) of live babies and 75% (224) received zidovudine (AZT) as well. The 6-week polymerase chain reaction (PCR) baby test uptake was 81% (239 out of 296 live babies). Of those tested, 2.9% (95% CI 1.3 - 6.2) tested HIV positive. CONCLUSION: Despite challenges faced by PMTCT providers in a resource-constrained setting, this state-aided hospital provides a comprehensive and integrated service and has achieved outcomes that compare favourably with those in the developed world. The efficacy of single-dose nevirapine in PMTCT of HIV in the HIVNET012 trial was 11.9% (95% confidence interval (CI) 8.2 - 15.7).5 The generalisability of trial results to the general population can be difficult.6-8 The challenges with extended prophylactic regimens, when PMTCT is integrated into existing health systems and monitoring to evaluate whether they have the desired effect, are even greater. A study in KwaZulu-Natal (KZN) used dry blood spot testing at immunisation clinics to estimate the prevalence of HIV.7 Despite the availability of nevirapine the vertical transmission rate of HIV was estimated at 20.8% (CI 18.2 -23.6) in 6-week-old infants. In 2005 the HIV prevalence among antenatal clinic attendees in KZN was estimated at 39.1%, the highest in the country.3 Here, more than almost anywhere else, effective PMTCT programmes are needed in order to achieve UNGASS goals. Owing to poor monitoring in PMTCT programmes, operational research in areas of high HIV prevalence is necessary to determine outcomes and provide answers to service delivery problems. This study reports on the outcomes achieved in a PMTCT programme in KZN where extended PMTCT regimens have been introduced. McCord Hospital is a state-aided hospital in Durban, South Africa, serving patients from a wide catchment area. It offers patients an affordable alternative to overcrowded public services and expensive private medicine. Funding for the hospital comes from the KZN Department of Health (43%), patient fees and grants. In 2004 McCord received funding from the Elizabeth Glaser Pediatric AIDS Foundation (EGPAF) to expand and improve the PMTCT programme. The PMTCT programme is integrated into general antenatal services. Staff comprise one medical officer, two nurses, two counsellors, four midwives, one administrative assistant and an obstetrician. Four first-visit midwives are trained as counsellors to reduce the number of steps in the care pathway. Most staff have other duties and are not dedicated to PMTCT only. Since 2004 the programme has been part of the KZN provincial PMTCT programme. Voluntary counselling and testing (VCT) is conducted on an individual basis. Since February 2005, pre- and post-test counselling and testing have been done by the same midwife to improve integration. A rapid HIV test (Abbott Determine) is used and positive results are confirmed with a second rapid test (Smart Check). The test results are given as part of the initial visit. HIV-negative women are offered a repeat test after 3 months. All pregnant women are encouraged to bring their partners to the antenatal clinic. Partners are also offered testing and, if HIV positive, are referred to Sinikithemba, the HIV clinic at McCord Hospital. Disclosure is encouraged. Psychology services are available for couples experiencing serious relationship difficulties due to discordancy. Early in the study period CD4 counts and viral loads were not being done on all women, but this improved and now all HIV-positive women have a routine CD4 count after post-test counselling. A goal of the PMTCT programme is to identify women who need highly active antiretroviral treatment (HAART) (CD4 <200 cells/µl) for their own health and to fast-track them onto treatment. Women with a CD4 count above 200 cells/ul have their viral load measured to determine the most suitable PMTCT prophylaxis. Furthermore, all HIV-positive women have their viral load measured at 36 weeks' gestation to determine the most appropriate mode of delivery. CD4 lymphocyte counts are performed by flow cytometry (Becton Dickinson) and viral load is measured by means of the Amplicor HIV-1 Monitor PCR test (Roche), with a lower limit of detection of <50 copies of HIV RNA/ml. A private laboratory service is utilised for these tests. A polymerase chain reaction (PCR) test is done on HIV-exposed babies whose mothers return for the 6-week postnatal check. The PCR results are given 1 week later when the mother returns for a further appointment. The paediatrician is immediately informed of HIV-positive babies so they can be enrolled in the Sinikithemba children's programme. Over the 18-month period the McCord PMTCT guidelines were based on evidence from international studies.11,12 If the CD4 count was below 200 cells/µl, women were started on HAART. If it was >200 cells/ul, women received either HAART, AZT antenatally and nevirapine at onset of labour, or nevirapine alone at onset of labour. The decision was based on viral load, gestational age at presentation and patient finances. 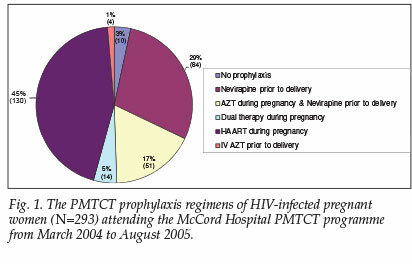 After June 2005, when more funding became available, women with a CD4 of >200 cells/ul received either AZT antenatally and single-dose nevirapine at the onset of labour (if viral load <1 500 copies/ml) or prophylactic HAART during pregnancy (if viral load >1 500 copies/ml). HIV-infected pregnant women were counselled about infant feeding options and assisted in deciding whether formula feeding would be acceptable, feasible, affordable, sustainable and safe for them. If not, exclusive breastfeeding for 6 months was recommended. An observational cohort design was utilised. Data were collected retrospectively and prospectively since the study began in June 2005 and continued till all the women had delivered. The study population was all pregnant women attending McCord Hospital for their first antenatal visit from the beginning of March 2004 till the end of August 2005. Quantitative and qualitative data were collected from antenatal clinic charts, electronic records, review of routine monthly PMTCT data, record and document review, individual key informant interviews with staff members and participant observation. Data were captured and analysed using SPSS 13 (SPSS Inc., Chicago, Ill). EpiCalc 200013 was used to calculate bivariate relative risks and 95% confidence intervals. The study was approved by the University of KwaZulu-Natal Biomedical Research Ethics Committee (reference number H055/05) and the McCord Hospital ethics committee. No individual patient consent was deemed necessary as it was an anonymous record review. During the 18 months all 2 624 women (100%) attending the antenatal clinic received counselling, and 91% (2 388) of them were tested for HIV. Sixty-nine per cent (1 811) were tested at McCord Hospital, 577 (22%) were tested elsewhere and 236 (9%) were not tested. Of women attending the clinic, 338 (13%) were HIV positive (95% CI 11.6 - 14.2). Of these 338 women, 89% (302) completed their antenatal care at McCord and 36 (11%) were lost to follow-up. The mean age of the HIV-infected cohort was 28 years (range 18 - 40 years) and 24% were married. Twenty-five per cent of partners (668) were tested for HIV. The HIV status of 113 (37%) partners of the 302 HIV-positive women who completed their care at McCord was disclosed to the service. It was found that there were 42 (37%) discordant couples. The mean gestation at first visit was 30 weeks (range 14 - 41 weeks). CD4 counts were done on 262 women, with 67 (26%) having a CD4 count of <200 cells/µl and 195 (74%) >200 cells/ µl; the median CD4 count was 293 (interquartile range (IQR) 195 - 451). Initial viral loads were done on 166 women but 36-week viral loads were only done on 121 women. The median viral load at first presentation was 3.9 logs (IQR 3.1 - 4.6) or 7 787 copies/ml (IQR 1 403 - 39 856). At 36 weeks' gestation the median viral load was <50 copies/ml (IQR <50 - 558) or 1.7 logs (IQR 1.7 - 2.7). The regimens of 293 women (97% of the 302) were documented (Fig. 1). Of the 130 women (44%) who received HAART during pregnancy, 121 (93%) were started before or at 36 weeks' gestation. Seven were started after 36 weeks and in 2 cases the gestation was not documented. Sixty per cent (77) of the women who received HAART had CD4 counts >200 cells/µl. In 14 cases in which two antiretroviral drugs had been given during pregnancy, these were started by private doctors before the patient came to McCord Hospital. In the group of 302 HIV-positive mothers there were 3 intrauterine deaths, 1 miscarriage, 1 maternal death (with baby in utero) and 297 live births. One baby died shortly after birth. Of the live births 70% (209) were by caesarean section. Of the live babies, 290 (98%) received nevirapine after birth and 76% (224) also received AZT. In 6 cases (2%) there was no record of the baby receiving any antiretroviral therapy. The 6-week PCR baby test uptake was 81% (239 of 296 live babies). Of those tested, 2.9% (95% CI 1.29 - 6.19) (7 babies) were HIV positive. Of the 296 mothers questioned after delivery, 93% planned to formula feed. Although the sample size was low and the study was not powered for it, bivariate analysis was performed to determine risk factors for transmission. The only significant (p<0.05) risk factors were found to be a first antenatal booking later than 36 weeks' gestation, a CD4 count in the mother less than 200 cells/µl, and the baby receiving nevirapine only as opposed to nevirapine and AZT (Table I). As expected, the lowest prevalence of MTCT of HIV was in mothers on HAART (1.8%; 95% CI 0.3 - 6.8) and the highest in mothers who received single-dose nevirapine only (8.2%; 95% CI 3.1 - 18.8). The incidence risk ratio of a baby being infected with HIV was 5.9 (95% CI 1.1 - 31.1) if the mother's CD4 count was less than 200 cells/µl compared with more than 200. If the baby received nevirapine only as opposed to nevirapine and AZT, the incidence risk ratio was 5.3 (95% CI 1.2 - 22.7). Unpublished data from a situational analysis of PMTCT done in KwaZulu-Natal showed that 84% of health care workers agreed that men should be involved in the maternal health of their partners. A study in Uganda showed that at a routine antenatal service only 1.8% of partners tested for HIV.18 At McCord Hospital just over a quarter of partners are testing and discordant couples are being identified and counselled. Follow-up of infants is a problem. At Coronation Hospital more than one-third of infants were never brought back for follow-up and more than 70% were lost to follow-up by 4 months of age.9 In KZN problems have been experienced with PCR testing of babies. An Integrated Management of Childhood Illnesses (IMCI) review (unpublished data) in 2005 revealed that only 47 of 209 clinic managers were able to report on the percentage of babies PCR tested. Many clinics had stopped PCR testing because of the long turnaround time. The 6-week follow-up for PCR testing of babies at McCord is just over 80%. The 1-week turnaround of the PCR test is achieved because the midwife who is responsible for monitoring obtains all the results in time for the mothers' return visits. The low transmission rate to babies compares with rates achieved in sites in developed countries. The fact that 44% received HAART contributed to this, and the group cannot be compared with sites providing nevirapine only. The need to educate mothers to attend for their first antenatal booking before 36 weeks' gestation is highlighted by the results of this study, as are the advantages of a higher CD4 count. This study may have been subject to selection bias, since 11% of the HIV-infected women were lost to follow-up and may have been systematically different in some way to those studied. Furthermore, since McCord Hospital charges a user fee, patients attending may be socio-economically and educationally better off than those attending public facilities. This may influence health and compliance and the results may therefore not be generalisable to the general antenatal population of South Africa. This study relied on data collected for routine monitoring. There may have been errors in written and electronic records. The rate of transmission was very low; with only 7 babies who tested positive, low power was therefore achieved in analysis to determine risk factors for transmission, making multivariate analysis impossible. The risk ratios and transmission risks are therefore from crude bivariate analysis only and could be subject to confounding that could not be controlled for in the study. This programme has done remarkably well at implementing PMTCT of HIV in a developing country with limited resources. It has managed to maintain its success despite changing and extended regimens. The service offered is comprehensive and integrated. It has achieved reduction of the rate of transmission to babies to 2.9% during the first 18 months while the programme was still evolving. Despite the successes, areas of the McCord PMTCT programme need attention. The low breastfeeding rate is of concern. Over 90% of women choose to formula feed; however, these babies are not specifically followed up to assess mortality or illness, particularly due to diarrhoeal disease. This is important to determine how accurate the infant feeding counselling is in flagging women who are not appropriate for formula feeding. Although they are referred on to the adult HIV clinic, it is unclear how many mothers who need HAART continue with these services. The incentive for HIV-positive mothers to obtain care and treatment is great during pregnancy but possibly wanes once the baby is born and found to be HIV negative. More should be done to monitor this and keep these women engaging with the services. Women who received short-course HAART during pregnancy for PMTCT prophylaxis (60% of those on HAART) should be monitored in order to start them on ARV therapy when their CD4 counts reach the treatment threshold. Finally, not only the HIV-positive but also the negative babies need to be monitored over time. In this way the medium- and longer-term effects of PMTCT interventions can be evaluated and the safety of strategies improved. We are grateful to Candace Westgate, Hiliary Plioplys, Kristie Nixon and Chantelle Young for their assistance with data collection, Professor Quarraisha Abdool Karim and Professor Myra Taylor for commenting on the manuscript, and the McCord Hospital manager, Helga Holst, for advice and support. 13. Brixton Health. EpiCalc 2000. Version 1.02 [computerised program]. [ Links ] Brixton, UK: Brixton Books, 2000.